This same Higher Power that has watched over, guided, inspired and led the Spiritual Giants of our faith Moses, Jesus, Mohammed, Rama, Buddha, and the great Gurus, on whose shoulders we stand today—this same Higher Power watches over us. That same Spirit that hovered over the waters at the dawn of creation lives and dwells in you, our graduates. You have spent time in and outside the classroom learning about the Giant thinkers, leaders, entrepreneurs, prophets and activists of human history. You have written papers, essays, taken tests and perhaps found a role model or two in the process. Today it is time for You to stand up to become the Giants of our own time. What lies intermingled with the excitement and relief of this moment for you is also a foreboding unknown filled with doubt and fear. You stand on the precipice of a future before of you–of college, of public service, of summer jobs and training in the armed forces. On the edge, toes hanging off, I took a deep breath, and stepped off into the unknown. At first all I was present to was the rushing wind and my fear, and then about half way down, something happened I did not expect. Something extra-ordinary. The valley below and its vast beauty and magnificence hit me… the peace and quiet and beauty of that moment filled me up and I became part of something much larger than my self… I became a part of that valley. I also became someone who could climb mountains and jump off them. In a moment’s notice Rhonda Crosswhite, a sixth-grade teacher at the Plaza Towers Elementary School in Moore, Ok had to change her game plan. She had to think quickly work as a team and protect her sixth grade class from one of the most destructive tornados of our time. She covered six students with her body, lying on top of them in one of the school’s bathroom stalls. While the tornado raged above her destroying the school, she called upon her faith and prayed out loud. It is in moments like these where we turn to our traditions—our scriptures to give us a word of encouragement and wisdom for what lies before us. Do you have a scripture in your pocket that you can turn to when you need it? Find one, memorize it, learn from it. It matters where your roots are. Even the most faithful, most hardworking, most accomplished people will face difficult times. Are you grounded, well rooted to with stand even the worst of storms? Your faith is the stream that nourishes the roots of who you are. Not far from the mountain where I stepped off is a sanctuary of living Giants. 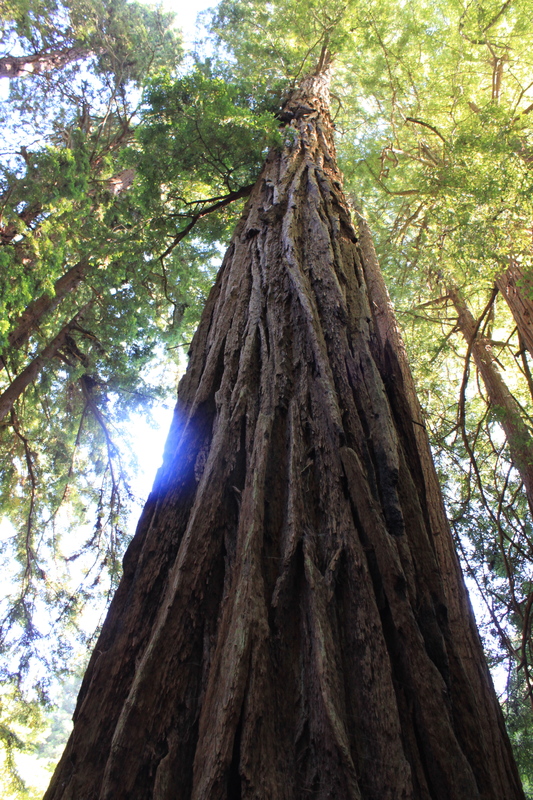 Muir Woods boasts some of the tallest trees in the world. These Giants soar upwards to 300 feet and are on average 500 – 800 years old some as old at 1200 years. Stand in the presence of these giants and you will be humbled. They are witnesses to much of our human history and will be living legacies for generations to come. How is it that they can live so long? Because they are resilient. We can learn from these trees. They are tough, living through forrest fires, droughts, high winds and storms. They are deeply rooted, interconnected, and live in community. As you step off into this new future, learn the art of being resilient like these trees. A Community of Redwoods stand in tribute to Giant who once stood there. What happens when giants fall? When one of these giants of our age falls, a huge hole is left in the sky. There is a clear space left empty by the death of one of these amazing trees of Creation. What happens next is remarkable. You see, their root structure is intertwined with the roots of it neighboring trees and is alive and vigorous. All around the space where the Giant stood, shoots of new trees begin to grow in a circle. They do not take the place of the fallen giant. They stand and grow as a community around it as if to say, “We are witnesses of the great one who once stood here”. You are that young community of future giants in our midst. To who or to what great idea will your life become a living legacy? Jesus says, “I tell you, the one who believes in me will also do the works that I do and, in fact, will do greater works than these”. You will do even greater works than those who came before you, but not on your own… as a community. The relationships you build and maintain will have the power to break us or save us as a planet. Time Magazine most recently called your generation “Lazy, entitled narcissists, who still live with their parents.” They have dubbed you the “Me me me Generation,” suggesting that you are more caught up with FaceBooking, tweeting, photo bombing and instatgraming than you are interested in taking time to make a difference in the world around you. I disagree. I believe you are the “We Generation”; communicating across continents and ideas, participating in the political process in ways we could not have imagined 5 years ago. You have the power to change ideas, topple regimes, end human trafficking, demand equality, stand for lasting peace, and create sustainable economies. All by using the very social media you know so much about. Your phones are not mirrors of your image, they are tools for changing the world. As you prepare to step off your own carefully constructed Zip Line of life, think not so much about what you will do—for that course of your life will take many twists and turns. It may surprise you and disappoint you sometimes all in the same day. Rather, ask yourself, who will you be? What will the impact of your life and the quality of your character be? I invite you to stand in your faith and declare today that while we may differ in culture and language, in faith traditions and future college ala maters, I believe we can agree that our faith teaches us some very important lessons. We should be instruments of peace and justice. We should bring compassion in difficult situations and above all we must practice the art of loving—loving the loveable and the unlovable. More important than pledging allegiance to any high school mascot, college ala mater, or even national citizenship, I believe the most important citizenship we can claim is to be a citizen of this world—ultimately stewards of God’s Creation. I share with you now a pledge that in a minute I am going to invite you to stand with me and take. May this pledge be a reminder of who you are and who you can be in the years ahead. Family and Friends of these graduates before us… We are indeed in the presence of Giants. May they be a living legacy to what we hold dear. Amen. Great graduation speech, I am passing it along to the rest of my family. I feel it also spoke to me as I prepare to retire from 29 years of work, I am stepping off the mountain! !